Put your tractor to work clearing fields or cutting trails through dense overgrowth. This rotary brush hog has a 60-inch working width and will makes it easy to cut thick vegetation including brush and brambles up to one inch in diameter. Our First DR Tractor-Mounted Brush Hog! Designed specifically for Category 1, 20-45 HP tractors, our DR PTO Brush Mower features a rugged, 11-gauge, welded steel mower deck, two swinging brush blades, and a cast-iron, 45 HP gear box. Use the DR PTO Brush Mower to reclaim overgrown fields, clear roadside vegetation, or to cut trails. It will cut and mulch just about anything you can drive over, including brush and saplings up to 1-inch in diameter. This mower is great ,it was very easy to put to gather . Dr is the beast. It is big and just under 500 lbs! So far I have cut my fields of grass twice and no issues. Not too difficult to assemble if your use to equipment and tractors. More difficult to connect the Cat 1 hitch than I expected. Requires level platform/drive or garage floor to assist in connecting the hitch. Took a while to learn the process of connecting and getting use to the mower hanging off the back of the tractor. Starting up the mower always sounds if something is going to break due to the swing blades unfolding as the gear box brings the rotor up to speed and the blades slam into position. Like all DR equipment it is built tough. Get the delivery option that drops ships this to your door, its a big heavy steel pallet. Recommend assembling mower on the shipping platform and lifting off after all hitch work is in place to connect the tractor. Make sure there is enough length for the drive shaft before you buy. My drive shaft on a John Deere 2032R needed the full length of extension at about 60 inches. Uses about 2 quarts of gear oil to initially fill gear box and you'll need a grease gun. I am using the steel shipping platform for storage of the mower when not in use. With a 5' cutting deck and 1/2 thick cutting blades, this will cut down 1" saplings with no problem! The hardened blades stood up to many impacts and lasted through the 100 hour testing without needing replacements. The blades are easy to replace, when needed, using just a wrench. The solid rear wheel is great, it's the level of durability needed for a machine like this. Q.Does this have a slip clutch or shearpin design? 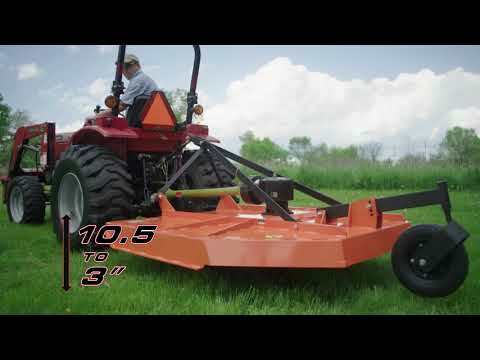 A.The 60" Three-Point Hitch Field and Brush Mower has a 5/16" Grade 5 Shear Bolt drivetrain protection. Please feel free to contact us if you have any other questions. Q.What gauge is the steel used for the deck? A.Thank you for your interest in the DR 60" Tractor Brush Mower. The deck is constructed of 11-Gauge Steel. Please feel free to contact us if you have any other questions. A.Thank you for your interest in the 60" Three-Point Hitch Tow behind Field and Brush Mower. The tip speed is 17,318 ft/min. The gearbox is made in China. Please feel free to contact us if you have any other questions. Q.What are the shipping dimensions for this? A.Thank you for your interest in the 60" PTO Field and Brush Mower. The shipping dimensions are 68"Lx72"Wx33"H. It will weigh 550lbs. Please feel free to contact us if you have any other questions.